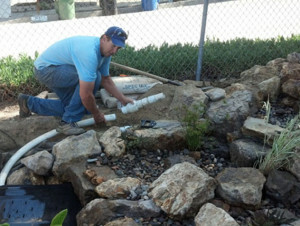 Pond maintenance is so critical to the health and well being of your pond, plants and fish. The first thing that we like to do before we start pond maintenance is to look at the condition of the fish, plants, clarity of the water and the flow of the pond. We want to make certain that everything is “normal” before starting the pond maintenance. This pond requires cleaning of the filters at the top of the pond in the waterfalls and also clean out the basket and wash the filter pad in the skimmer. This pond also has a more advanced cleaning system called bio media. What is nice about having the bio media is that the debris is picked up off the bottom of the pond instead of the skimmer which just picks the debris off of the top of the pond. The media filter does require extra pond maintenance but is well worth the effort. Beyond cleaning out the filters and the media filter other maintenance that has to be performed with this pond, is netting all of the debris floating in the pond and off of the bottom of the pond not picked up by the filtration system. Because there are streams to this pond, we always make certain to remove any debris in them so as to not slow down the flow of water in the streams. It is also just as important when completing maintenance on a pond to cut back all the plants and remove the dead leaves on the lilies. It is very important for the success of the pond that all debris and foreign objects are kept out of the pond so the fish and plants will be happy and healthy. To complete the maintenance we always balance the water with a conditioner and add a natural pond bacteria. Pond Maintenance Tips: What is pond maintenance? Why is it important? Pond Maintenance: What is pond maintenance? Why is it important? 0 Responses to "What is pond maintenance? Why is it important?" Pacific Ponds >> Pond News >> Pacific Ponds >> pond maintenance >> What is pond maintenance? Why is it important?